“I’m a native English speaker from the U.S., and my Spanish was at a low intermediate level when I started at Habla Ya. I really enjoyed my time at the location in Boquete, and I learned a lot. I am now quite conversational (of course I still make tons of mistakes! ), and I am able to speak Spanish with my clients at work. I consider many of the Habla Ya teachers good friends after my experience at the school, and I am thrilled to have Facebook as a way to keep in touch with them. I attended Habla Ya for six weeks, and I was extremely motivated since I need to be proficient in Spanish for my job. The professors at Habla Ya took this seriously and helped me focus most on conversation and my comfort/confidence level. Through some strange (probably uncommon) circumstances, I think I had all but maybe two of Boquete’s Habla Ya professors while attending the school. This was a terrific experience for me because each teacher has a different style and some focus more on specific things than others. I especially liked the teachers who corrected me when I made the same mistakes repeatedly, as I learned a lot from this. It can be a tough balance because correcting every single mistake would slow the flow of conversation, but the corrections were always very helpful. 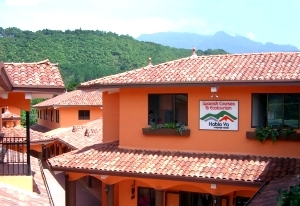 I highly recommend doing a homestay during your time at Habla Ya. My Spanish would not have advanced nearly so far if I hadn’t been speaking it every day, all day. I stayed with a lovely family in which the parents spoke almost no English, and that meant I had to use my Spanish to communicate and couldn’t slack off once classes were over. It was also wonderful to experience the culture of Boquete and the culture of Panama in a family setting. Boquete is a lovely town, and I was glad I stayed in one place while I studied. I’ve taken Spanish classes elsewhere at a time in my life when the travel part of the trip was more important to me than the language acquisition part of the trip, but for my time in Boquete I was very focused on my studies. Boquete was a good choice as a place where I could concentrate. You just have to be careful you don’t spend much of your lunch and free time at American-owned establishments where you can speak English – it’s easy to fall into this, but it definitely doesn’t help in the long run. 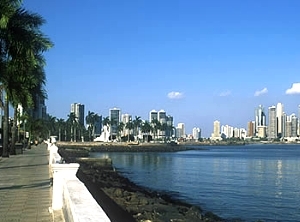 If you can spend a couple of days in Panama City before heading to Boquete, that is very worthwhile. A trip to see the canal and spending some time in Casco Viejo would be my two top recommendations in Panama City. 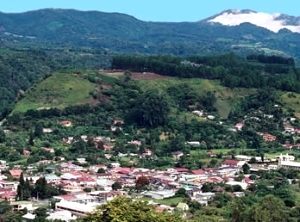 If you can get to David while you’re in Boquete, you will see a very different type of city from Boquete, and I enjoyed that too. Taking the bus to David isn’t difficult, and anyone at Habla Ya can tell you how to do it. The excursions are also really fun (you can do these with Habla Ya or a number of other outfitters around town), and Giselle at Habla Ya is amazing at helping with travel booking, rides to and from the bus station, etc. I felt like Habla Ya took really good care of me while I was there. I felt very safe in Boquete, and the people were incredibly friendly. I fell in love with the place and hope to return. As I said, I had many teachers at Habla Ya, and I thought they were all very good. I enjoyed both the group and the individual classes. I started with group classes plus one hour of individual instruction each day, and the last week or so I had three hours of individual classes per day with no group classes. I didn’t plan it this way, but it worked out really well. The group classes are great for learning grammar, learning from questions that other students ask, making friends, etc., and the individual classes allow you to ask all of your own questions, even when they don’t pertain to what you’re studying at the moment, and to talk talk talk talk talk (the most important thing you can do!). I’m very happy with how my experience at Habla Ya played out, as the last week or so I was literally just conversing with my individual instructors for one or two hours at a time, and this is just what I needed. And it was such fun to get to know them and hear about their lives and families and dreams. I highly recommend each of the teachers I had. Tamara was my individual professor for nearly the entire six weeks, and she helped me focus on legal terminology and the language I would need in my job. We did role plays so I could practice working with clients and get more comfortable in that format, and she helped me develop my conversational skills a lot. She is very good at correcting you without interrupting the conversation, and conversations are so pleasant and useful that the time just flies by. She speaks English well, which was helpful when I wanted to know how to convey a specific idea or sentiment in Spanish and couldn’t really explain it in Spanish. Yubal was my group class professor, and he did such a great job keeping the group cohesive and making sure everyone had the same opportunities to share and practice their Spanish. He is very inquisitive, so it was fun to talk with him in Spanish about different political issues, problems, cultures, etc. In fact, that was one of my favorite things about the school. The lessons were structured so that we were studying and talking about major issues like capital punishment, drug trafficking, etc. The subject matter was fascinating so studying was interesting and kept your attention. In a very short time I learned so much from Ericka and Widad. I felt like they took my Spanish up an entire level just in my last week or so. Yaira spent hours with me just chatting, which is the best way I’ve found to improve my Spanish, and she corrected some mistakes that I had been making over and over. I only had Irasema for my first week, but that was a great way to get adjusted to speaking Spanish daily, and she was very kind and patient. I think Arelis was my teacher for only one or two days, but she was an excellent teacher and a great friend and spirit throughout my stay in Boquete. Lorena, Maritza, and Alberto were very helpful and generous with their time, and I always felt like my progress learning Spanish was everyone’s biggest priority. They all speak Spanish and English, but no one ever tried to switch to English when I was taking forever to say a simple sentence in Spanish. Thank you to Tiffany from Denver, Colorado, for contributing her feedback, and to Habla Ya for providing images. 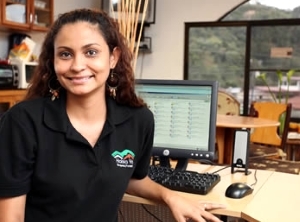 Spanish Course Panama: Cactus offers Spanish courses in the thriving capital city of Panama City, the Pacific mountains of Boquete and the idyllic Caribbean beach location of Bocas del Toro. Spanish courses are also available across Spain and Latin America. There are many reasons to start learning a new language – work, personal development, even just simple curiosity – but for me, a self confessed language phobic, there was only one thing that could get me learning again…love. I come from a typical English family. We have visited the same resort on the Costa Del Sol many times, each time spending a sunny week in “England on Sea” with its Irish bars, English breakfasts and expats. The only Spanish I ever knew (and rarely used) was a few choice phrases enabling me to find the bathroom or order a beer. Then, three and a half years ago, I met Thais through a mutual friend and was instantly smitten with this girl from Barcelona. At first I was lazy on the language front, relying solely on her amazing level of English, but after my first trip to visit her family it became clear that if I wanted to communicate with her family and friends, I would need to learn Spanish. Decision made, I now had to figure out how best to go about studying. A quick Google search for Spanish classes in London brings up many different schools trying to get your business. However, time and time again I saw Cactus’ name popping up. When I investigated further, I was pleased that Cactus offered classes at times, levels and prices that suited me perfectly. I booked my first course starting in January 2011, a set of ten weekly two hour lessons at a London Bridge school. I was so pleased with my level of Spanish after my first course I decided to go straight into Level 2 in March 2011. I was lucky enough to have the same teacher and many of the same people who were in my Level 1 class. The group was a lot smaller which was good as we had more one on one time with Imma and were able to ask more questions. The class, as with Level 1, was lively and conducted entirely in Spanish (English was only used to clarify if needed). I had a great time and again made lots of new friends, so much so that on the last evening we all went out for tapas (with the teacher as well). I spent the summer using my new found Spanish skills on holiday in Florida after asking Thais to be my wife (¿Quieres casarte conmigo?). By September I was ready for a booster course before a Christmas/New Year holiday to Barcelona where I wanted to put my Spanish skills to the test with my future extended family. I registered for an intensive 5 week Level 3 course at the Picaddilly school with a new teacher Eduardo; this would be split into 2 evenings a week and the class was a lot smaller (4-5 people). I found that the intensiveness really suited me and helped me to focus on learning Spanish. Eduardo remains to this day one of the best Spanish teachers I have ever had. I thought after these courses I would take a break from learning, as with a wedding in Spain to plan I wouldn’t have time for lessons, but it was early 2012 when I saw an interesting photo competition on Facebook from Cactus. I entered a photo and thought nothing of it, as I never win anything anyway. Much to my surprise I received an email a few months later telling me I had won a week’s intensive language course in Valencia. I was speechless and booked my flights the next day. Cactus not only offers great courses here in the UK, but has partnered with some of the best language schools in other countries to offer residential intensive courses. Mine was in Valencia at the amazing Taronja school. I would be staying in a shared flat with eight other students (I got my own room) from around the globe, classes were either morning or afternoon and consisted of four hours a day with two different teachers. I had Ana and Maria Jose and really enjoyed the lively lessons and course content. In addition to the classes, my study was supported by just being in Spain and speaking/hearing the Spanish language. So after a class, a new French friend and I went to Mercadona (a supermarket). It was really fun walking around a foreign supermarket speaking Spanish (and some English) and good practice for later. What made the trip for me, though, was the total immersion of it all. Free afternoons and evenings were filled with activities and outings organised by the school (some at no extra cost). 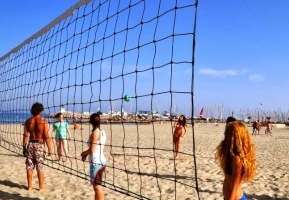 Activities included an “Intercambio” or language exchange, a Paella night, a Salsa night, a trip to a Bodega and a walking tour of Valencia. Throughout all these trips we were speaking as much Spanish as possible. This really made the trip feel like a holiday and not like going to school. When I got back to the UK Thais was truly shocked at how fluent I had become, and I was ecstatic with my level of Spanish, so much so that I have returned for a further 2 week stay since then (I even got to see some of my old friends). Now all of this was for a reason – love – more importantly, for my wedding speech. I got married on the 26th May 2013 on a beach south of Barcelona. I was so nervous – but not about getting married. I was nervous because I knew that both the guests at the wedding and the speech in my pocket were over 50% Spanish. I am pleased to say that I performed the speech without disaster and I think I rendered a few of my Spanish family speechless. My wedding was not only the happiest day of my life but the proudest as well. Thanks in part to Cactus. Many thanks to Gary for taking the time to tell me about his experience and to hopefully inspiring others to learn a language. Cactus Language Training offers a variety of language courses in a range of languages throughout the UK, US and the world. Cactus student Rob Mepham tells us about his 5-week French course in Annecy and how it has helped him immerse himself in French life. When Rob Mepham’s feedback came in after his French course in Annecy I knew that I wanted to speak to him. Using words such as ‘my French vocabulary has exploded and grammar improved beyond expectation’, I wanted to find out what exactly had made his experience so good – and pass this on to others considering a similar venture. Now ensconced in his own little corner of France (or not so little, given his 17 acres of farmland), Rob kindly took the time to tell me what had motivated him to learn French and to pass on a few valuable tips about relocating overseas. Retiring from the military, Rob’s course in Annecy was part of his resettlement training from the Ministry of Defense. An immersion course in France turned out to be considerably cheaper than the equivalent in London – and decidedly more effective, given that it’s in-country. It was also incredibly easy to book, Rob quoting Sandra at Cactus as being particularly efficient in organising his course and replying to every email personally. He chose the chic and pretty town of Annecy in the foothills of the Alps as the location for his studies, with the hope of indulging his passion for paragliding at the same time; the fact that he never actually got to do this became irrelevant as everything was, in his own words, better than he could have imagined. Once at the school, where he was enrolled on a 5-week elementary French course, Rob could not have found the staff more helpful and patient. He was able to learn at his own pace, aided by the language being spoken slowly around him, and he picked up a vast amount of vocabulary by jotting down new words in class and reading French articles and magazines in his own time. He was in a class with a mix of nationalities – Chinese, Taiwanese, Mexican, American and Swedish, to name a few – and, most importantly, had no opportunity whatsoever to speak English, meaning that he had to get by and make himself understood in French whichever way he could. The learning curve was steep and he improved dramatically. This was further enhanced by his stay in a host family, where he says he learnt just as much as at the school. His host gave him ample opportunity to practise the language, keeping her speech simple and clear, but she also gave him space to do his own thing – the best of both worlds. I asked Rob what he thought about learning a language later in life (he is 53), as so many people think that they are too old to learn a language or that classes might be full of teenagers straight out of school. Rob’s class was a fascinating mix of 17-62 year olds and, although he conceded that it depends on the type of person you are, he felt that he had more self-confidence taking a course now. He clearly thrived during his time in Annecy and I found his story even more heart-warming as he claimed to be dreadful at languages at school. It just goes to show that taking a language holiday abroad bears no resemblance to childhood memories of sitting in a classroom at school, too embarrassed to say anything. Moving on from his experience in Annecy, I was keen to find out more about Rob’s subsequent move to France. I asked him whether he thought knowledge of the language was important in immersing himself in another culture and got a resounding ‘yes’! His 5-week course was perfect as it gave him a good grounding; two or three weeks, he thought, was probably not enough. His French has been invaluable in tasks such as registering his car and sorting out its MOT. He has even found the locals more accepting of him because of his attempts to speak French – I say ‘attempts’ as Rob modestly keeps telling me that it’s far from perfect, but this is exactly the point. People don’t really care how good you are, or not – what they care about is your effort to respect and speak their language, and Rob is a shining example of this. For others considering relocating abroad, Rob offers a useful piece of advice; it’s good to try to go somewhere where you already know someone. It can be invaluable to have someone who’s already done it answer your questions, especially when it comes to the ins and outs of French bureaucracy. For him, however, the move was extremely easy: he and his wife used a British-based estate agent, which paid for itself with all the hassle avoided. With so many Brits emigrating, they also found internet forums a great source of advice. I have to admit that what I loved hearing most was how Rob’s course has given him confidence to speak in French to the coach from his local paragliding school, near Limoges where he now lives, and in local shops. Speaking some of the language has undoubtedly made a huge difference to his integration into French life, and I found his enthusiasm and determination utterly inspiring. He hopes to resume his French studies again soon – perhaps at the university in Limoges – and I wish him all the best for that and his future in his new home country. 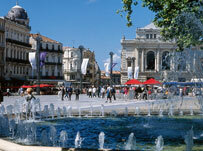 We offer French courses in Annecy and in many locations across France and Canada. Evening courses in French are also available in the UK and US. We also offer private and corporate language training for relocation. 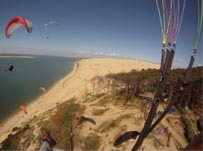 The photo at the beginning of this article was kindly contributed by Rob; he took it whilst paragliding at Dune du Pilat, the highest sand dune in Europe, near Bordeaux. Winner of the Cactus 2011, Suzanne Furstner Foundation Scholarship, talks about her CELTA course. It was a Friday evening when I was sitting in the library with some of my colleagues, after having worked non-stop all week. We were researching for an assignment, furiously reading and taking notes, when from behind a tall stack of books a voice calmly stated that at that moment, the rest of the world was probably enjoying a cold beer and some well-deserved R & R. We barely entertained the idea, concluding that whilst it was attractive we had our work cut out for us, and so we dropped our eyes back to the books, saving our cervesas for another day. Such is the life of a CELTA trainee. 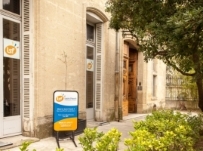 In February 2012, I attended the Cambridge CELTA course at International House Barcelona, one of the most reputable teacher training centres in the world. Made possible by the generosity of Cactus TEFL’s Suzanne Furstner Scholarship, the course was a rich and rewarding experience for me. Four-weeks of full-time training was made up of input sessions (a sort-of mix of workshops and lectures) and teaching practice, with the evening hours dedicated to lesson planning and completing written assignments. I received continuous support and direction from the course tutors, each of whom brought to the training room their years of teaching experience. My class of 18 CELTA candidates was made up of individuals from the UK, the EU, the USA and Ireland, with me, the Australian, being the furthest from home. Some of my classmates were preparing to enter the workforce for the first time, whilst others were looking for a change in career and lifestyle. The training room was a fun learning environment from Day One, when an ongoing impromptu comedy routine was birthed due to an unusually high number of witty personalities in our group. My expectations of the course had been set-up by a friend in London who had earlier completed his CELTA, and whose forewarning of long days and an intense transformation period proved to be true. I had experienced teaching English for a short stint before the course and was acutely aware of my need for quality training. I found the CELTA methodology to be both stretching and awakening, and unlike other candidates without prior experience I had to unlearn a few bad habits and replace them with ‘new and improved’ techniques. An example of an area of learning for me was with regards to developing flexibility in the role of teacher. I devoted a lot of time to preparing my lessons, and sometimes the lessons didn’t go according to plan, either because of an aspect I had overlooked in my planning or because of a class dynamic which effected a change in direction. This experience taught me to ‘let go’ a bit as a teacher, to be guided by the students and to allow and encourage organic developments to occur. It taught me that being prepared for a lesson is equally as important as being ready to respond to its natural flow and momentum. At the completion of the course, our group enjoyed dinner together at a restaurant to celebrate our success and hard work. A few of my classmates shared how they questioned if teaching English was the job for them, because in a course of such intensity you really have to work relentlessly from woe to go. However to live the CELTA as your every day life would be impossible; it’s an intensive training period crammed with all the content and practice you need to start working. The course is challenging but the end result is worthwhile; teaching is a rewarding and fun job that helps others, and having a CELTA opens up doors to employment in many countries around the world. 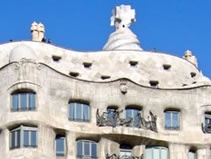 As for me, I came to Barcelona exclusively to attain the CELTA, and five months later, I’m still here, nurturing my love of coffee and drinking in the beauty of this city. And when I’m not riding my bike or trying to improve my Spanish, I’m in the classroom, teaching English. Cactus TEFL is an admissions and advice service for quality teacher training courses worldwide. Cactus works with well-known course providers to offer CELTA, TESOL, equivalent and online courses in over 90 locations across 36 countries. Cactus TEFL also offers free post-course careers advice and support, as well as access to our very own TEFL jobs board and job alerts. The next Suzanne Furstner Scholarship will be in 2016.
http://www.cactusworldwide.com/blog/wp-content/uploads/2013/08/SFF-logo.jpg 151 203 Sarah Chamberlain http://www.cactusworldwide.com/blog/wp-content/uploads/2013/07/cactus-blog1.jpg Sarah Chamberlain2012-06-15 15:26:332015-09-08 08:56:04Winner of the Cactus 2011, Suzanne Furstner Foundation Scholarship, talks about her CELTA course.